Microwave oven technology has swept the world for a cooking revolution for time saving but from health safety point of view, much is desired for the overblown benefits. Scientifically microwave (MW) have bad effect at low level of energy used . Most of the studies have shown that long term effect of MW cooking can cause carcinogenic effect. It has been noticed that living organism(humans) can be at the receiving end for burn and other injuries on the very high exposure to MW. The heating effects cause burn and other injuries due to microwave radiation. In chemotherapy the radiation burn are caused by radiation. The body part is being ionized whereas in microwave radiation is by dielectric heating. So one ought never to be in hurry a while using the Microwave. 1.In Microwave cooking, the heat is transferred very quickly better than in other systems of cooking. A microwave oven cooks thoroughly and very fast only for 1- 1.5 inch depth of solid food item but thicker solid food cooking is not even. This is where one of the problem is for this mode of cooking. Ensure that the solid food being cooked is not over 1.5 inch in depth. 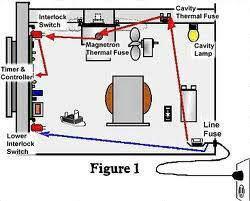 2.Sometimes while trying to dry the empty compartment of the microwave oven is worked unintentionally – can be hazardous due to resonance of the magnetron. Beryllium oxide used for insulator of magnetron’s have proven to be cancer giving. Also standing wave may be formed making the energy to run to and fro between the chamber surface and the magnetron, Thus overloading may be caused and burn out the tube. It may happen in the case of dehydrated food, or due to metallic wrapper of the food. The object containing food to cook either metallic or heat conducting type metal placed in the microwave oven can cause burn by acting as a heating element. It may act as an antenna sometimes and cause the damage. The damage may be caused after some delay after the microwave exposure. Pain or skin discolorizution or even some sort of skin damage are not very uncommon.